Access by Cycling, or how to become a bicycle city? On 7th of November 2013, the city of Kalmar was invited from the Energy Agency for Southeast Sweden in Karlskrona to give a workshop on ABC and bicycle friendly cities. Participants in the workshop were from Southeast Sweden and worked in the field of cycling and energy. The ABC-project was presented for 10 minutes followed by a set of workshop questions for the participants. After a joint discussion, all participants voted for the items they thought were most important in order to become a successful bicycle city, in respect to the city they lived or worked in. Most votes were given to: city planning with respect to cycling, a consistent cycling network and safety (crossings, lightening and separated cycle lanes). Also infrastructure was considered most important to focus on. This confirms that, in most cities, cycle infrastructure is still inadequate and that including cycling into the planning process in not yet obvious. On the account of communication, the participants believed in the power of using role models. Cooperation by e.g. lending bikes and cargo bikes and establish service points, was also given several votes. Lack of safe parking spaces. Impossible to take heavy and large loads on a bicycle. Lack of knowledge of traffic rules by cyclists. These were some of the challenges facing the ABC local workshop in Kalmar. Kalmar’s target group in the EU – project abc.multimodal is cycling consumers. The results of the target group analysis showed that cyclists were a significant consumer group, but that more measures are needed to increase the amount of cycling comsumers. 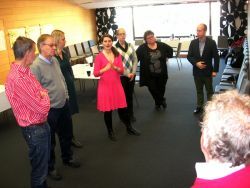 On the 7th of November 2012, a group of traffic planners, politicians and representatives from the commercial sector met during a workshop held by HUI Research, organized by Kalmar municipality. The main focus of the workshop was to examine different ways to increase the number of cycling consumers and to stimulate more consumers to choose the bicycle instead of the car. 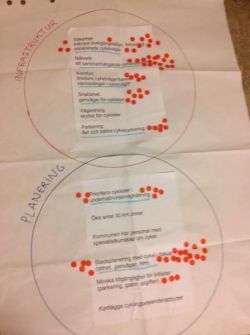 A brainstorming session resulted in a long list of proposed measures: ranging from facilities (such as better cycling lanes, and parking and better snow maintenance), to funding measures (such as free bike service and discounts) and campaigns, such as free loans of bike-trolleys, home-delivery for cyclists and better communication. Next, the group prioritised the measures which were to contribute the most to an increase in cycling consumers. High on the agenda were of course better cycling lanes, parking, lightning, security and other services (such as pumps) and a better way to combine cycling and public transport. But equally important were soft measures, such as increase the status for the bicycle, education for youngster and better and more cooperation with other parties in the city, both inside and outside the municipal organisation. This material will be Kalmars contribution to the international think tank scheduled in the ABC Multimodal project 23-24 of april 2013. Ultimately, these suggestions will contribute to future measures that will improve cycling conditions for consumers.